When overnight guests unexpectedly come over, sometimes I feel like sending them back. You don’t think I’m a terrible person, do you? It’s just that my apartment isn’t that big, and I can’t afford to provide guest rooms for my friends. What I can do, however, is offer them a comfortable futon, which doesn’t take up too much space but remains multi-functional. 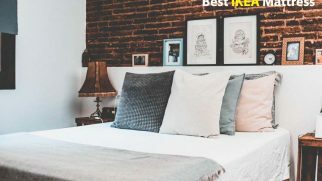 To help you with your unexpected guests, I’ve prepared 6 best futon mattresses, each of which might pleasantly surprise you. This classic model deserves the right to be among the best futon mattresses. It is soft, comfy, and high-quality. However, what makes this futon mattress a good “catch” for you is its versatility and flexibility in use. “Classe” works on the floor and on different frames, which means there are many ways that you can use it in. Additionally, this model is super easy to fold and store away. It can provide you with a nice sleeping area without taking too much space. It comes in 6 sizes: Twin, Twin-short, Full, Full-short, Queen, and Queen-short. There are 11 colors available. The filling consists of the anti-bacterial polyester blend with the Teijin MightyTop Eco material. The cover is made of 100% cotton, which is natural and breathable. The best thing about this model is how comfortable it is. I didn’t expect it to be so stuffed and dense, being filled with just simple fabrics. It is designed to be used on the floor, but it provides enough cushioning to make you feel like you’re sleeping on a firm mattress. Plus, I think it can be used on a futon frame since it comes in many different sizes. The worst thing I’ve noticed about this model is its insufficient thickness. To me, 3 inches is enough, given the fact how dense this futon mattress is. However, some sleepers might want it to be taller or require more cushioning, so it’s just a heads-up for you. To be honest with you, I loved sleeping on this futon mattress. Its classic design and soft cotton cover are meant to make it the best futon mattress for sleeping both on the floor and on the futon frame. 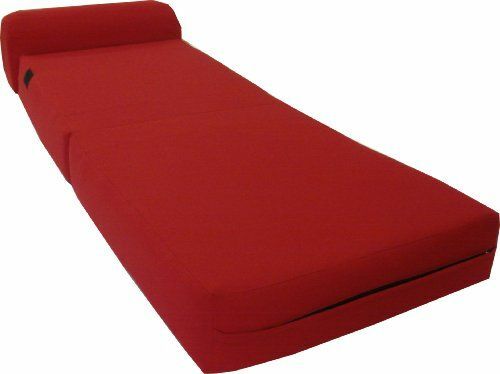 This is another item on our list that can become the comfiest futon bed for your home. It is soft and supportive at the same time and can fit any Full-sized futon frame. This futon feels like a real bed! It is thick and filled with dense memory foam. It is responsive and supportive, with just the right amount of cradling. This top-rated futon mattress is an awesome option for people who want something compact yet as close to a regular bed as possible. The filling is memory foam, which is dense and supportive, plus the cotton blended fiber. The cover is made of cotton twill, which is soft and plush to the touch. The mattress comes in 6 colors, so you will be able to fit it in any interior. It is 10 inches thick, which is meant to support even the heavier sleepers. The best thing about this model is how thick and comfy it is. There are no coils, so you won’t feel any lumps. Moreover, the mattress is thick and dense enough to prevent you from sinking in, providing a decent level of support. The foam is also rather firm, which means it is suitable for larger users. The worst thing I’ve noticed about this mattress is the off-gassing. This is a common issue for many memory foam products, but it might concern some allergy-prone and sensitive users. The odor disappeared in two days, after which I was able to sleep on this mattress. Overall, I enjoyed sleeping on this futon mattress. It is firm and supportive but doesn’t feel too stiff. It does belong to the pricier category, but it also has a lot to offer. The filling consists of three layers of antibacterial polyester blended with 50% TEIJIN MIGHTYTOP (R) II ECO material. The cover is 100% cotton (205 thread). The mattress is currently available in two sizes: Full and Twin. It comes with a removable mattress cover. The coolest thing about this model is the fact that it is ideal for back and stomach sleepers. Because the mattress isn’t too thick or squishy, it offers just the right amount of support for your spine in both of these sleeping positions. The worst thing about this top-rated futon mattress is its thickness. While being great for back and stomach sleepers, this model might not be thick enough for people who prefer sleeping on their side. It just can’t provide enough padding for the protruding pressure points, unfortunately. I feel like this futon mattress by FULI, despite being very simplistic, can satisfy many users. Especially back and stomach sleepers. It is nicely made and offers a rather flexible use. If you need a comfortable, foldable, and cheap futon, this model might be a great option for you. This floor futon mattress by Rolling Bed costs less than $100, which makes it suitable for pretty much any budget. Additionally, it is nicely made and feels rather comfortable even when being used on the floor. The filling includes white cotton, foam, and a polyester layer. The outer shell is 100% polyester. The mattress measures 80 x 30 inches. The absolute best thing about this model is, of course, its affordable price. To be honest, I was rather surprised when testing this futon. Being sold at only $60, it is unexpectedly comfortable. It features a mixed filling and feels nice even if you use it on the floor. Hands down, this is the best budget-friendly model you can find. The worst thing about this foldable futon is the off-gassing it is accompanied by. I guess this is the courtesy of the foam component in the filling. The odor isn’t chemical but it’s rather distinct, which can be a huge drawback for some users. Overall, this is a great futon mattress for the money. It is super easy to use and store. Plus, it’s very comfy! There are many things to love about this model. It comes in a wide variety of colors, so there’s an option for any interior. Additionally, it can be used as both a mattress and a chair. 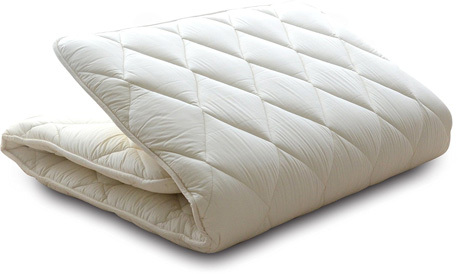 It can also be called the best futon mattress for side sleepers thanks to its foam filling. Being rather dense and supportive, it provides a good balance of firmness and cushioning, which is great for side sleepers. The mattress comes in 4 different sizes. It is 6 inches thick. There are 17 different colors available. What I liked the most about this model was that it’s suitable for side sleepers. Many futon mattresses (especially the traditional ones, which you are supposed to use on the floor) are more on the firmer side, which makes them unsuitable for side sleepers. But this particular model is thick and cradling enough for this sleeping position. The biggest issue you might have with this particular model is trying to find suitable fitted sheets for it. This mattress has a rather unusual sizing. For instance, the Queen measure 58 x 74 inches, which is smaller than regular mattresses. Therefore, fitted sheets will not fit it properly. And the regular sheets might slide off during the night. I must admit, this futon mattress managed to pleasantly surprise me. It is flexible in use and offers enough padding even for side sleepers. And I’m sure many users will be able to appreciate that. This next futon mattress has everything you might need. It is reasonably priced, works on different frames (and the floor), and offers good comfort levels. With a modern design, it can complement almost any interior. Additionally, it is nicely made. Such a combo of features makes this model the best value for money you can find on the market. It is 6 inches thick (however, there is an 8-inch option available in the Navy color). The filling is made of polyester padding. It measures 54 x 75 inches. 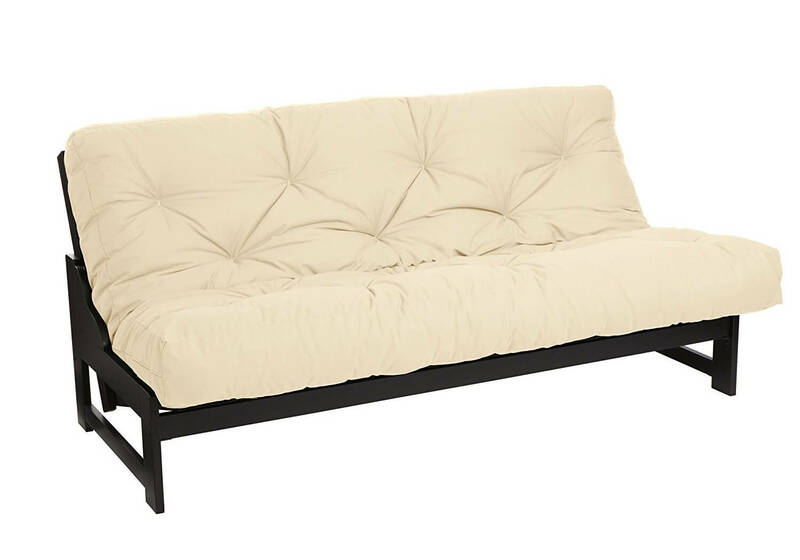 The coolest thing about this futon is the value for money it offers. Being sold at only $100, this model is rather flexible in use and holds up to the regular usage rather well. 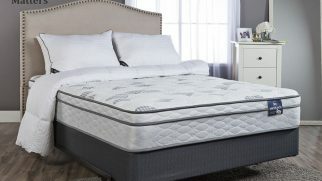 The mattress is also comfortable and works on almost all frames. For such a price, it’s a real steal, if you ask me. The worst thing about this futon is the fact that you might need to buy an extra pad to go with it. You see, it isn’t very thick, so you might feel the frame underneath it when using the bed/sofa (especially if you are a heavier user). Of course, this feature will depend on everyone’s personal preferences, but I still feel the need to warn you of this potential issue. For such a reasonable price, this model is a great find. It works well as both a bed and a sofa and doesn’t require too much space. To me, that’s a great combo! Adjust the comfort level of your futon mattress. When it comes to mattresses, sometimes it’s hard to find the perfect one. 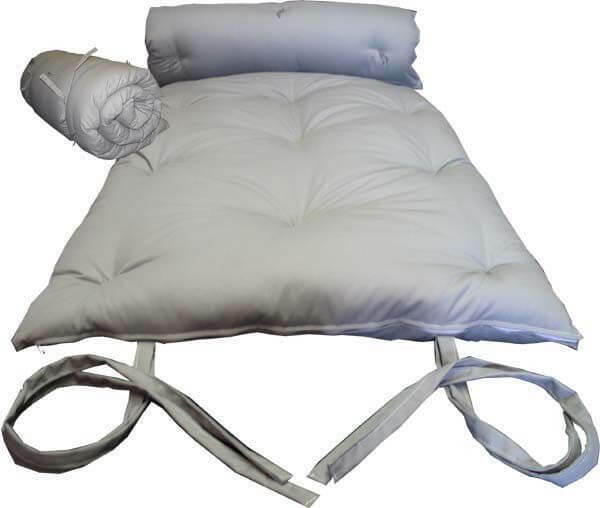 The one that would support your body weight properly while allowing you to relax and feel super comfortable. If you happen to get a new futon that doesn’t feel heavenly comfy, you can adjust it using a futon pad. They come in different thickness and material options. Therefore, you have the freedom to alter the feel of your mattress. Prolong the life of your bed. 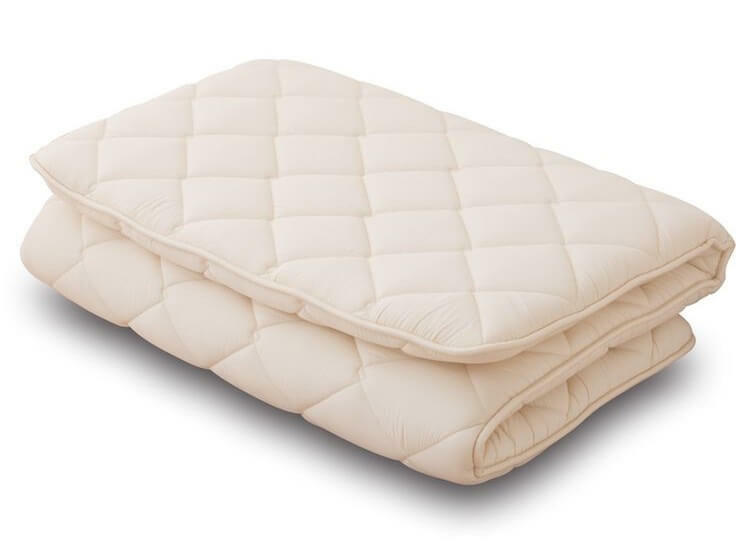 A futon pad will protect your mattress from occasional spills and stains. It will also prevent the surface of the mattress from wearing out too fast, which means your new bed will serve you longer. This can also help you save some extra money. Keep in mind that getting a futon pad has one drawback to it. 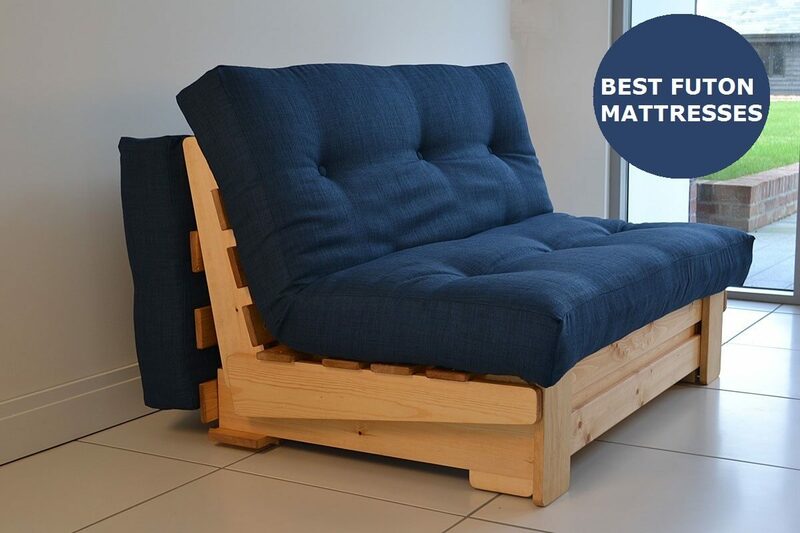 It might make your futon look a bit bulkier. Therefore, if you have a limited living space, you might want to avoid getting a pad. Instead, you can look for a waterproof cover (if you want to protect your futon mattress) or a comfy blanket (if you need to adjust the comfort level of your bed). They are easy to fold and store. If you need to move or take your futon mattress with you to stay somewhere overnight, portability won’t be a problem for you. They can give you a chance to make your room a multi-purpose one. If you’re living in a small space and can’t use a room strictly as a bedroom, a reversible futon bed can help you with that. It can serve as a sofa during the day and as a bed during the nighttime. They allow you to find your perfect comfort level. For instance, you can layer a couple of futon mattresses if you prefer more cushioning. They are affordable. 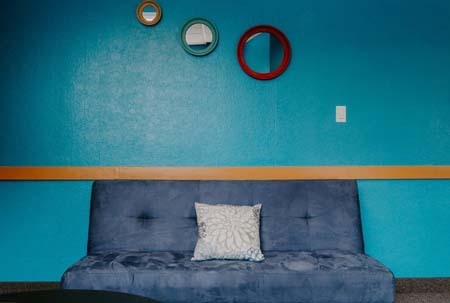 Futons are cheaper than regular mattresses, even if you have to buy a futon frame separately. Thickness. This feature is important since it can influence the comfort levels. If you’re used to sleeping on a firm surface, you don’t need a really thick futon mattress. However, if you want more padding, a thicker and taller mattress will be a better option. Use. If you need a futon for occasional guests and don’t plan to use it regularly, there’s no need to invest in a super expensive luxurious model. Size. This one is obvious. The size will depend on how much space you have and how many people are going to sleep on the mattress. Cover. It should be durable and pleasant to the touch, but don’t forget about the color as well. You want your new futon bed to fit in your home’s interior, right? To be completely honest with you, I used to feel quite skeptical about futon beds. I just didn’t believe they could be comfortable. However, after testing out these 6 futon mattresses, I have changed my mind completely. Want to know which one was the most comfortable? To me, it was the “Classe” Japanese Traditional Futon Mattress by Emoor. This classic model was designed to be used on the floor, but I feel like it can be placed on the futon frame as well if you choose the proper size. It is thick and dense, plush to the touch, and super easy to use. When placed on the floor, it feels like a real firm mattress. And to me, that’s the main sign of comfort. Do you think you’ll be using a futon mattress a lot in your home? If yes, tell us which particular model seems the most appealing to you.